Moderate grower to 10 ft. tall and wider. 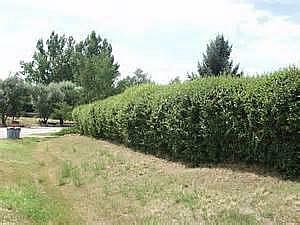 Valuable hedge material for difficult soils. . Can be used as an informal barrier or sheared. A super tall screen used for privacy, division or as a background for more colorful plants. Ideal for dividing front yard from back or blocking unsightly neighbor views. Resilient boundary marker; use to cover swimming pool or tennis court fence. Use a dense evergreen as a companion such as Dwarf Scotch Pine (Pinus sylvestris 'Glauca Nana') or the large Japanese Black Pine (Pinus thunbergiana). Underplant with interesting perennials like Variegated Moor Grass (Molinia caerulea 'Variegata') or Francee Plantain Lily (Hosta x 'Francee') on the shadier side. 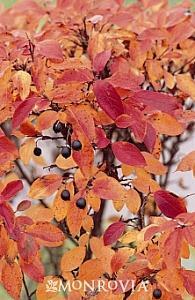 Cotoneasters are classified into the immense Rose family, Rosaceae. It is a genus named by Fredrich Medicus, a noted authority on North American flora and director of the botanic garden at Manheim, Germany. He named it from the Latin for quince-like to describe the leaves of some species. All 50 species are native to the temperate regions of the Old World. This species is native to northern China and was well known in Peking when westerners arrived.